Evil and suffering have come to the forefront once again after a gunman opened fire on a crowd of people from a hotel room-turned-arsenal 36 floors above the carnage. Dozens and dozens of families woke up Monday morning missing a loved one who never made it home from a country music festival on the Las Vegas strip. Hundreds of others woke up in a hospital bed, and thousands more are grappling with horrific images and memories that will likely be with them for the rest of their lives. “This morning we awoke to the tragic news that at least 50 people were killed and over 200 wounded last night in a mass shooting at a Las Vegas outdoor concert. Please join me in praying for the families of those killed and for all the injured,” Franklin Graham posted a few hours after the shooting. Since then, the death toll has risen to 58, and the total number of casualties has climbed to more than 500. In response to what is now the deadliest mass shooting in modern U.S. history, a group of Billy Graham Rapid Response Team chaplains is en route to Las Vegas to offer emotional and spiritual care to people who are suffering. Five chaplains are scheduled to arrive today, with plans to have 11 chaplains on the ground by Tuesday. Each one is trained in crisis response and has previous experience ministering after a violent attack in a place that seemed safe. Jack Munday, the international director of the Rapid Response Team, called the Las Vegas shooting an “unimaginable, traumatic situation” and said the injured, the grieving and the first responders were in his prayers. “My prayer is that they know they’re not alone and that hundreds of thousands of people are praying for them,” Munday said. This year, Billy Graham chaplains have responded to terror attacks in Quebec, Canada; London, England (March and June); Manchester, England; and Barcelona, Spain. 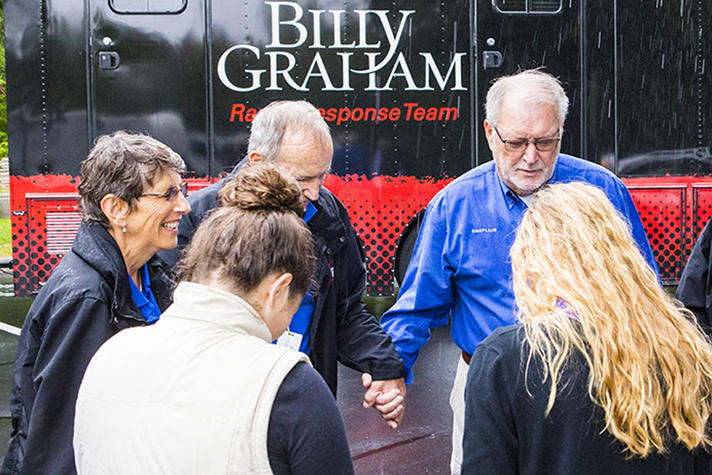 In 2016, the Billy Graham Rapid Response Team ministered after terror attacks in Belgium, France and in Germany (Munich in July and Berlin in December). The team of chaplains will work alongside several Las Vegas-area churches as they listen to and pray with those who have been affected by Sunday night’s tragedy. And as hundreds begin to recover from the physical damage done, the chaplains are praying God will open doors for emotional and spiritual restoration as well.